Andrew Lennox Henderson passed away peacefully on Friday morning October 12 2018 at Vanderbilt Medical Center Nashville TN after a 10 month difficult battle with MDS and Leukemia. Andy was born on April 19, 1980 in Exeter NH, to Lennox and JoAnne ( Geoffrey) Henderson and lived in Portsmouth for 30 years. He attended Portsmouth High School graduating in 1998. He followed his parents to Knoxville TN in 2009. He loved growing up in the seacoast area and still has many strong lifelong friends that he kept in touch with regularly. Andy learned many different areas of property maintenance, but enjoyed mainly painting where he was his own boss and could work independently. He had so many talents and found his true passion in restoring and repairing pinball machines. He shared this passion with many friends in Knoxville and at the recent award-winning Tokens Game Tavern. Andy had a magnetic personality and treated everyone as his friend. His positive attitude even carried over to the hospital. The doctors and nurses who saw him daily were always greeted with a smile and a wave and they commented on Andy’s wonderful spirit. So many were touched by the grace which Andy traveled the journey and he kept that spirit even while staying at the Hope Lodge with others battling their own cancer diagnosis. His pride and joy of his life was his 4-year-old daughter Ida Rose (Pickles), who he adored. He was a very tender and loving dad. He fought hard with all he had, to win this battle to be here for her. In addition to his daughter Ida Rose, he leaves behind his parents, Len and JoAnne Henderson of Knoxville TN , a brother Matthew Henderson of Bluffton SC. His Great Uncle Craig Geoffrey and his wife Colleen and their children Nate and Emma in Silver Lake NH. Aunts Sandra K Henderson /Federuk and her husband Al in Lake Jackson TX, Sally Henderson /Blackshear of Georgetown TX. 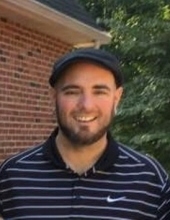 His daughter’s mother, Hayley Ball and her partner Adam Henry of Lenoir City TN, and Hayley’s family , Rebecca and Jess Hale, Ben and Melissa Qualls and Jeremiah Ball, who have been there for him through this all the way, ready to meet any or all needs they truly are family to Andy as well. The family will receive friends from 1 to 2 p.m. on Sunday, Nov.11 2018 at the Click Funeral Home Farragut Chapel followed by a Celebration of Life at 2 p.m.
2008 Charlotte Ave. Nashville TN. 37203. Click Funeral Home Farragut Chapel, 11915 Kingston Pike is serving the Henderson family. To send flowers or a remembrance gift to the family of Andrew Lennox Henderson, please visit our Tribute Store. "Email Address" would like to share the life celebration of Andrew Lennox Henderson. Click on the "link" to go to share a favorite memory or leave a condolence message for the family.